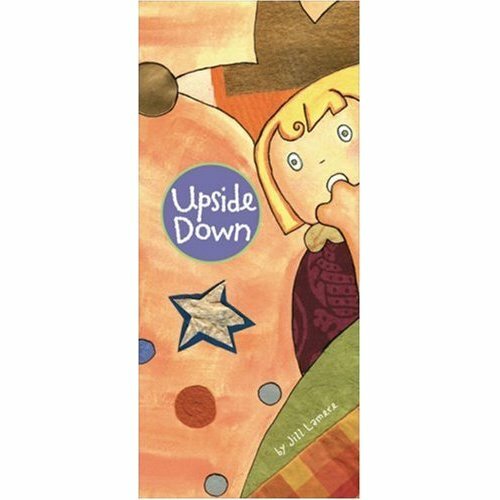 One of our favorite board books is called Upside Down. 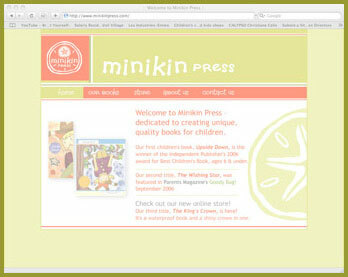 It’s written by Jill Lamere of Minikin Studio. It’s so cleverly done, that when you get to the final page you actually turn the book upside down and continue reading! The way the girl is positioned on each page works so that she’s either right-side up or upside-down. She deals with common things that parents and children battle such as what to eat and bath time. The rhyming is clever, the artwork is adorable, and the kids love it! We’ve given this book as a gift to several preschoolers. 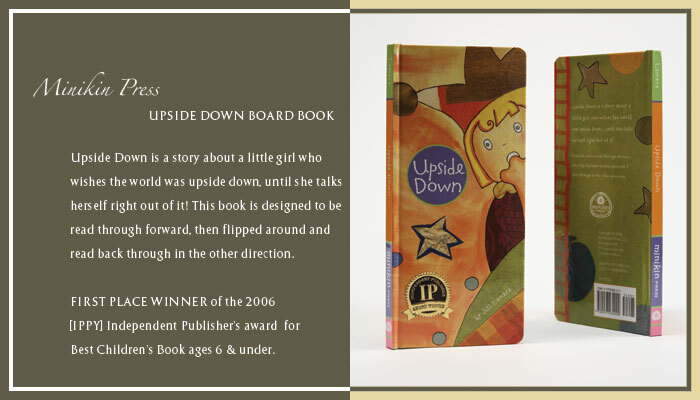 Upside Down is a story about a little girl who wishes the world was upside down … until she talks herself right out of it! This book is designed to be read through forward, then flipped around and read back through in the other direction. Jill Lamere holds the Independent Publisher’s 2006 award for Best Children’s Picture Books (ages 6 & under). The King’s Crown, which is vinyl and meant to be used in the bathtub is another fave. You read the book about a little boy in a castle, and when you’ve reached the end you snap the book together and it makes a crown for your child to wear! There are snaps in two spots so that it will fit more than one toddler. Kids take a journey through an enchanted castle in search of hidden treasure and are treated to a surprise at the end of the book. 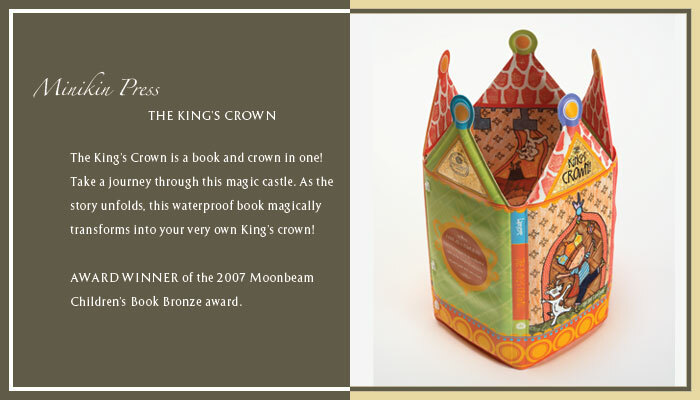 As the journey unfolds, this waterproof book magically transforms into the reader’s very own crown, all shiny with gold foil. 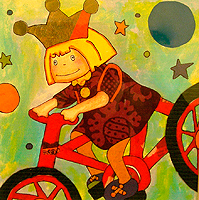 Children will delight in the story, and the crown will become a mainstay of dress-up wardrobes. 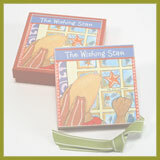 Innovative and durable, this storybook is perfect for use in the tub or pool. 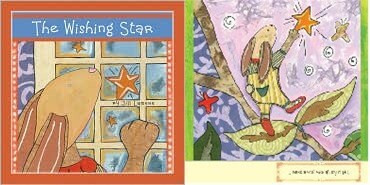 And this talented author and illustrator’s other book, The Wishing Star is as unique and innovative as the others. It’s a bedtime story about a little bunny, and you actually fold the pages into a 3D star, which is glow in the dark, to hang in the child’s room at night. A sweet, funny lullaby that opens up into a glow-in-the-dark three-dimensional star when the story is finished. 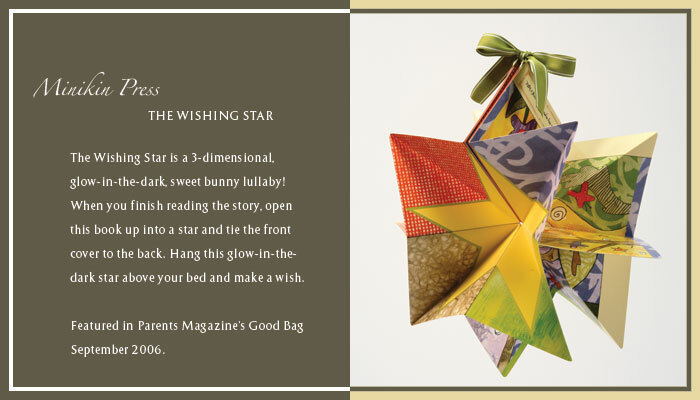 Little ones can tie the front cover to the back cover and hang this star above their bed and make a wish. The packaging is also very cool. The King’s Crown, comes in a little bag with a handle, and The Wishing Star comes in a heavy-duty keepsake box. Very classy. Now go get yourselves copies of these awesome books for your kids!